A very fast and easy recipe with just a handful of ingredients that tastes absolutely amazing! 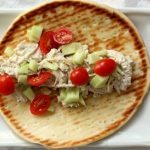 Cream cheese is stirred into shredded chicken with Greek seasonings and lemon juice and then served on pita bread and topped with tomatoes and cucumbers. A simple family friendly meal that everyone will love. Place chunks of onion in bottom of Instant Pot. Pour in the broth. Place trivet on top of onions. Place chicken on top of the trivet. Sprinkle the chicken with the Greek seasoning. Cover the pot and secure the lid. Make sure valve is set to sealing. Set the manual/pressure cook button to 12 minutes on high pressure (for frozen) and 10 minutes for thawed. When timer beeps let the pressure release naturally for at least 10 minutes. Then move the valve to venting. Remove the lid. Move the chicken to a cutting board and shred the chicken. Discard the onion and the broth. Place shredded chicken back into the pot. Stir in the cream cheese and the lemon juice. Turn the Instant Pot to saute until the cream cheese is all melted and incorporated into the chicken. Serve chicken on top of pitas with sliced tomatoes and diced cucumbers. If you’re not into pitas you could serve this chicken over rice or quinoa instead. If you’re on the keto diet you could probably just make this chicken and serve it plain without the pita. You could also serve the chicken on top of a bed of lettuce or spinach.